AnyMP4 Mac iPhone Transfer Platinum is the multifunctional software, which can not only transfer files between iPhone and Mac but also backup iPhone SMS and Contacts on Mac and backup some of the iPhone files to iTunes. Besides, this Mac iPhone Transfer Platinum can help you convert all popular videos and DVDs to iPhone compatible MP4, MOV, M4V, MP3, AIFF, ALAC, AAC and so on. And users can customize the output video effect with the powerful video editing features this software provides. 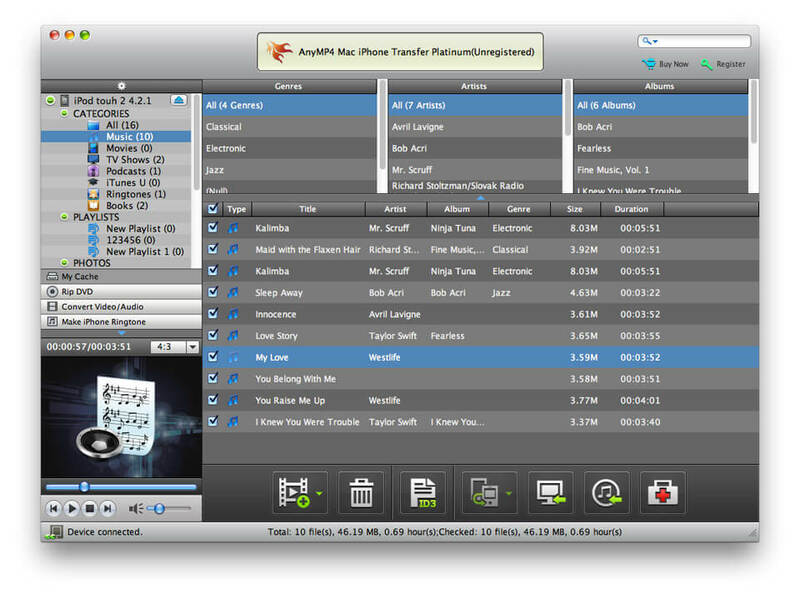 AnyMP4 Mac iPhone Transfer Platinum enables users to transfer the iPhone files such as music, movie, pictures, TV shows, Podcast, iTunes U, eBooks, Camera Roll, ringtone, SMS, Contacts, voice memos, camera shot and so on to your Mac. Also, this Mac iPhone Transfer Platinum allows users to transfer music, video, ePub, PDF, image files from Mac to iPhone, so you can watch local file on your iPhone. Besides, you can backup some of the iPhone files to iTunes, such as TV shows, Podcast and eBooks, etc. This software enables you backup some of the iPhone files to iTunes, such as TV shows, Podcast and eBooks, etc. Besides, with this software, you are able to backup iPhone SMS and Contacts to Mac in order to avoid missing the important information. Moreover, this program can also transfer files between Apple devices such as iPhone, iPod and iPad. Apart from that, this Mac iPhone Transfer Platinum can not only help you rip DVD movies to iPhone MP4, MOV, H.264 and more, but also convert any video to iPhone compatible formats. This software provides users powerful editing functions, so you can trim anytime-length of the video, crop the video frame, add watermark to the video, adjust video effect and so on. With it, you can even edit the ID3 information including name, artist, album, track number, lyrics, etc.